The following essay is chapter four of The Law of Christ by Charles Leiter, available at Granted Ministries. Posted with permission. Some have argued that when Paul says “the Law is not of faith,” he is speaking of a Jewish misunderstanding or distortion of the Law. They maintain that, in reality, the Law was a covenant of grace based on faith, but the Jews misconstrued it to be a covenant of works based on human performance. 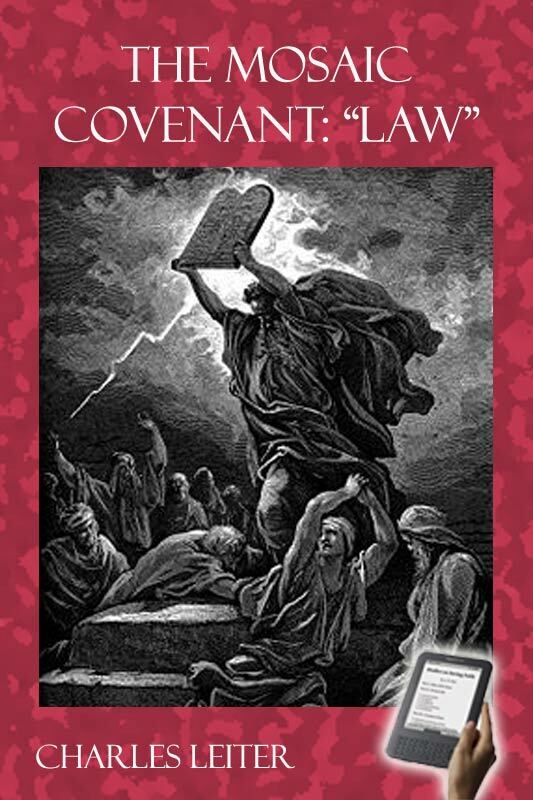 It is evident, however, that Paul is not setting forth here a Jewish misunderstanding or distortion of the Law, but the basic principles that characterized the Mosaic Covenant itself. To understand why this is so, we must remember that the Law had both a positive and negative side, setting forth the dual possibilities of either life or death. These possibilities were conditioned upon human obedience or disobedience. This is well illustrated by the blessings and curses pronounced from Mt. Gerizim and Mt. Ebal. Though this important passage should be read in its entirety if we are to feel its full impact, a few excerpts will be sufficient to demonstrate the fact that the Old Covenant was characterized by “conditions” and that its blessings (or curses) hinged upon human performance. Not only did the promise of “life” that was set forth by the Law represent more than mere “life in the land”; the Law’s “curse” also represented more than mere physical death or expulsion from Canaan. This is made clear by Paul’s statement that “Christ redeemed us from the curse of the Law, having become a curse for us.” The “curse of the Law” from which Christ has redeemed us by drinking the cup of God’s wrath, is none other than the eternal death that is the just “wages of sin.” Christ did not die to save us from a Jewish misunderstanding of the Law’s curse, but from the actual curse of the Law itself! In light of these clear teachings of Scripture, we must conclude that, whatever gracious provisions the Mosaic Covenant may have included, it nevertheless represented a covenant of works. (See Appendix E, Q. 7.) It was characterized by the principle that life is contingent on doing. It was not just another “gracious administration of the covenant of grace,” essentially one piece with the New Covenant, as some have supposed. The Law served a gracious purpose in God’s overall plan, as we shall see, but the Law itself was not based on the principle of grace! Instead, it was given to “increase transgression,” and its inevitable result was to “bring about wrath.” This is why Paul views the Old Covenant as such to be a “ministry of death” and a “ministry of condemnation.” It was not a Jewish misunderstanding of the Old Covenant that represented a “ministry” of death and condemnation, but the very “tablets of stone” themselves! The stark contrast between the demands of the Old Covenant and the provisions of the New is seen even in the very manner in which the two covenants were inaugurated. The giving of the Law on Sinai was an event full of fear, foreboding, and darkness—as sinful men trembled before an unapproachably holy God and the “holy, righteous, and good” law He was calling them to obey. By contrast, the New Covenant was inaugurated in the quiet intimacy of the Upper Room, where Jesus, “having loved His own who were in the world, loved them to the uttermost” and spoke to them words of comfort and assurance before laying down His life for them. The inauguration of the New Covenant did indeed involve darkness, earthquake, and terror, but it was the darkness that fell upon Christ Himself as He redeemed His people from the curse of the Law and drank the bitter “cup” of God’s wrath reserved for them! We see in these verses that Law, because it is characterized by the principle of “works,” is opposed to both Promise and Faith. And it is precisely this opposition that leads to Paul’s question, “Is the Law then contrary to the promises of God?” If Paul were teaching that the Law is a covenant based on the principle of grace, this question would never have arisen. But as it is, God has done something apparently inexplicable: He has made unconditional promises to Abraham and then followed them with a covenant that is conditioned on human performance! Does He really intend that men will earn their salvation by keeping the Law? Paul’s answer is an emphatic, “May it never be!” “For if a law had been given which was able to impart life, then righteousness would indeed have been based on law.” God never intended the Law as an alternate method of salvation, because man’s sinful condition renders the Law “unable” to impart life. The problem lies, not in the Law’s promise of life, but in man’s inability to keep the Law and thus obtain its “righteousness.” For this reason, Paul speaks of “what the Law could not do, weak as it was through the flesh.” Instead of bringing life to fallen men, the Law brings only death: “And I was once alive apart from the Law; but when the commandment came, sin became alive, and I died; and this commandment, which was to result in life, proved to result in death for me.” The commandment did indeed promise life, but it “proved to result” only in death. The same principle applied to the survival of the nation of Israel as a whole. Time after time, when the nation of Israel should have been utterly destroyed, it was Promise, not Law, that preserved a remnant. Under the conditions of the Law, the people of Israel richly deserved every judgment that came upon them, and the fact that God did not “make an end of them or forsake them” is attributed to His grace and compassion, not to His legal justice. When Israel sinned, no prophet ever interceded for the nation on the basis of Law, but solely on the basis of grace, imploring God for mercy and appealing to the covenant God had made with Abraham, Isaac, and Jacob. Do I see God’s demands as “holy, righteous, and good” and His requirements as only good and right? Have I stopped blaming God for my sins by excusing them or by imagining that He expects too much of me? Do I realize that I have fallen infinitely short of living a life of perfect love to God and man, and that, in myself, I stand hopelessly condemned in God’s sight? Can I see that I am condemned, not because of any fault on God’s part, but because of my own selfish and wicked heart? Do I realize that I will never be able to establish any righteousness of my own before God or do anything that will obligate Him to love and save me? Have I given up on ever being able to “merit” the merits of Christ? Do I realize that unless salvation is entirely by grace, I will never be saved? Deuteronomy 27:11-28:68; see also Leviticus 26. See Appendix E, Q. 3.